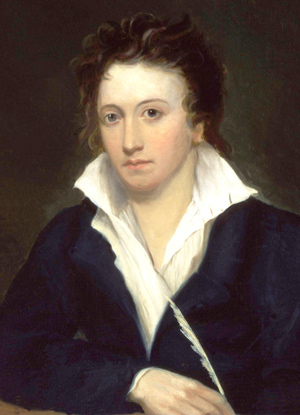 Shelley was one of the archetypal Romantic poets. He was born in Sussex and educated at Eton and University College, Oxford. He published his first novel in 1810 and was expelled from Oxford in1811 for an atheist pamphlet. Soon he was writing full time and his output includes some of the greatest lyric poetry in English, and masterpieces of descriptive poetry of place, like Ozymandias. Shelley drowned while sailing along the Italian coast from Leghorn to his home in Lerici.